On Friday, the Vancouver Media Co-op launched an Anti-Olympic Archive, dedicated to documenting and archiving several year's of anti-Olympic resistance against the 2010 Winter Games. It includes statements, posters, call-outs, corporate news, photographs, etc. Much of this material was originally collected by No2010.com, a website that existed from 2007-2010 (shortly after the Olympics were over, the site mysteriously went offline). Below is a note from the creator of the site, Zig Zag. Have a read, or click here to check out the archive. As the 'webmaster' of No2010.com, I know the difficulty of finding websites from previous anti-Olympic campaigns. For the most part, they simply don't exist. Finding critical information on the Olympic industry was likewise very difficult. We had to resort to book learning, dusting off old library books (although what a surprise to find a number on the '36 Nazi Olympics). Thankfully there was also Helen Lenskyj's books on the 2000 Sydney Games (which as an added bonus also shared some aspects of colonialism, i.e. Indigenous land occupied by British settlers). 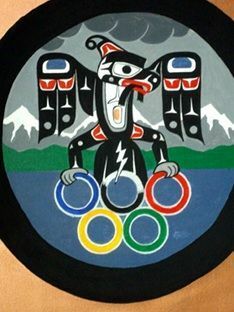 The anti-Olympic campaign in Vancouver and across the country over the span of several years is also now a part of history. But it's a history that can be easily lost, or at least forgotten. Because it is a history of resistance, one that state officials and corporate elites would rather everyone forget. And in such a history, there are many lessons that can be learned, actions to be inspired by, graphics and slogans to be adopted, etc. It is hoped that this archive is especially useful for those facing Olympic Games in their cities and regions (i.e., London 2012, Sochi 2014, Rio De Janeiro 2016, etc.). The archive site is arranged chronologically, beginning with some of the first activities dating back to 2002. For more recent updates, you must travel to the end of the site. As with other web sites, some of the links may no longer be active.